The exhilaration and adrenaline rush of tubing on one of Washington’s numerous waterways is a feeling that can’t be matched. Unfortunately, the popularity of this recreational water activity has caused a drastic swell in watercraft and tubing injuries. Two decades ago, tubing accidents accounted for roughly 2,068 serious injuries. 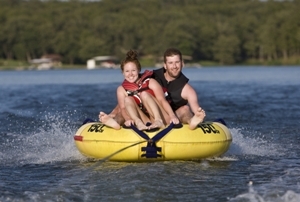 As of 2013, an annual 8,000 tubers are injured as a result of tubing accidents. According to a Nationwide Children's Hospital study, tubing-related traumas have risen by 250 percent over the past twenty years. The study, which was published in the Journal of Physical Activity & Health, also delved into the most common causes of tubing injuries and where trauma most often occurred. Turbulence. The faster your tube is dragged, the more resistance it puts on the crashing waves. The more resistance, the more turbulence. If you’re not properly secured within the tube, you risk falling out and painfully skipping across the water’s surface. Ejection. If the tube collides with underwater plant life, jetsam or debris, or even a large wave crest, the tube can fling itself, and its passengers, high into the air. In other words, you’ll be catapulted from the tube and thrown away from it. If you're lucky, you’ll land in a clear area of water, but you do run the risk of hitting other vessels, debris, or land as you fall. Boat malfunctions and accidents. If the tube is out of control, the driver of the lead boat may circle as a rescue. However, if the driver isn’t careful, he could drive straight into you or cause additional damage with the propeller. Collisions. Since you can’t control the trajectory of your tube, it’s very easy to swing back and forth over a 90-degree arc. Unfortunately, other boat traffic and other tubers may also be within that arc, placing you at risk for a collision. All of the above risks place tube riders in severe danger of suffering multiple, if not fatal, injuries. Head trauma. Approximately 27 percent of tubing accidents result in some form of head, face, brain, or neck injuries. Joint and bone trauma. Sprains and strains also account for nearly 27 percent of injuries, as a result of the impact force of the tuber striking the water’s surface. Upper body trauma. 24 percent of tubing injuries are reported as severe upper body damage to the chest, collar bones, shoulders, back, and ribs. Soft tissue trauma. Muscle and tissue tears, hemorrhaging, and crush injuries account for the remaining 20-23 percent of sustained injuries. Risk vs. Fun—Do They Both Float? Before your next tubing adventure—and especially before loading kids up in a tube—consider these risks and take the necessary precautions. It is possible to have a fun and safe day of tubing on a Bellevue-area lake, but if you or your child is injured due to the carelessness of another boater, call our office to see if we can help. Feel free to browse our website for more boating safety tips. Post a Comment to "Common Causes of Water Tubing Injuries"